UK retailers are collectively missing out on an astounding £6.6bn per year due to a lack of investment in their mobile offering, according to a new report into mobile spending. The study, from VoucherCodes.co.uk and the Centre for Retail Research (CRR) indicates that despite retailers reporting their mobile share of online sales almost doubled from 2013 to 2014, from 15% to 28%, the study reveals a multi-billion pound opportunity is still being missed, both online and in-store. The VoucherCodes.co.uk and CRR report reveals 15% of consumers now use their mobile as a primary shopping device. What’s more, consumers with a propensity to shop on mobile are also more prolific online spenders overall, making 47% more transactions (14 compared to 9.5) and spending 55% more (£669 compared to £430) than purely online shoppers. A huge opportunity for retailers, consumers themselves estimate mobile spending is set to grow even further, with 73% saying they would spend more on their mobile and 62% more via tablet this year. This compares to only 20% saying they would increase spending on PC. Not only important in driving online sales, the study also revealed that the provision of mobile features would help drive consumers back into high street stores. Almost half of shoppers (44%) said they would be more likely to visit mobile-oriented stores in 2015, and more than a third (36%) also said they would spend more. Click and collect drives the most shoppers back into store, with 26% saying they would spend an additional 15 minutes in a store that offers click and collect, and spend an extra £18 per trip. Augmented reality was the second most important factor, with a quarter (24%) of shoppers saying that this would make them more likely to shop in a particular store, spending an extra 17.5 minutes and an additional £15.90 per visit. A more personalised experience using intel taken from online shopping habits would encourage consumers to spend an extra £9.40 per trip, and pop-up notifications alerting consumers to most relevant products or discounts would make them spend an additional £9.80 per visit. The VoucherCodes.co.uk and CRR study also showed that while almost a quarter (23%) of consumers love mRetailing, 40% still feel this could be improved, while a third don’t currently like using their mobile to shop. Slow loading pages (64%), websites that freeze (49%) and too many products to sift through (46%) are the top three barriers for shoppers using mobile. Security (43%) and poor payment options (35%) were also a concern. While mobile is now heavily integrated into consumer’s discovery and product browsing behaviour, less than one fifth (20%) of shoppers use mobile to make a final purchase. Only 16% of retail apps were used ‘a lot’ by consumers, according to the VoucherCodes.co.uk and Centre for Retail Research study. A quarter (27%) had been downloaded and never used. Claire Davenport continued: “A key outtake from our research is the importance of simplicity and a seamless experience. Of customers that use mobile as their primary shopping device, almost half (44%) said they did so because it was convenient. “Problems like slow loading sites and poor payment options are preventing consumers from getting to the point of purchase. An astounding 40% feel mobile retail could be improved – retailers could potentially monetise this group if they improved their offering. 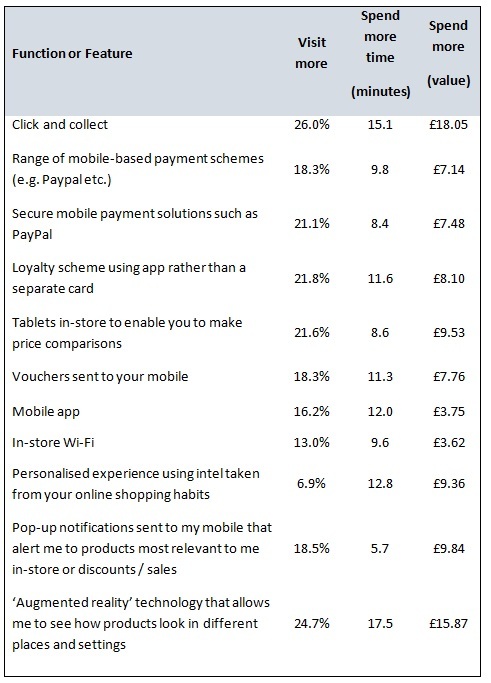 How does the UK retail sector rate its own mobile capabilities? Retailers undoubtedly recognise the importance of mobile retail, with 66% saying investment in this would help to drive sales growth and 88% believing they will get more visits in-store. Retailers estimated that they would lose one fifth of sales (22%) due to a poor mobile-enabled website, and a quarter (26%) due to a poor mobile application. Despite this, however, 17% of retailers still have no mobile offering. More than 59% of retailers believe they support mobile users effectively, and a further one in three (31%) said they were in the early stages of doing so. Only in in ten felt they were not supporting mobile users effectively, most apparent amongst convenience stores and general stores. The most mobile friendly retailers are supermarkets (80%), department stores (75%), pharmacy/chemists (75%) and those selling electrical appliances (75%). VoucherCodes.co.uk is operated by RetailMeNot, Inc. (http://www.retailmenot.com/corp/) the world’s largest marketplace for digital offers. The company enables consumers across the globe to find hundreds of thousands of digital offers for their favourite retailers and brands. Would the provision of certain features would make you more likely to visit, or spend more time and money in a particular store?